So many apartments or small houses have little or no defined entrance hall. You walk right into the living space. But an entry way should make a statement, and you can create one even when there is none. This photo, by way of Apartment Therapy, demonstrates the idea perfectly. The entry space is defined by the small rug, a wonderful wall mounted console table, statement mirror and bell lantern. In my own New York apartment I used a small demi-lune table, the painting, and the antique light fixture bought in England to create my entry. The table is small enough not to take up too much space, but defines the area. It's a place to leave mail and keys too! Here are some ideas to create your entry space from upcoming auctions. This elegant Continental neoclassical style mahogany demi-lune console table with a marble top is perfect. It has lovely curved detail and would tuck away nicely in the smallest of spaces. It's 40" tall and 33" wide. It has an estimate of $300 - $500 and is included in the St. Charles Gallery auction in New Orleans later this month. For something a bit more dramatic, this Empire painted parcel gilt bronze and marble console table definitely fits the bill. 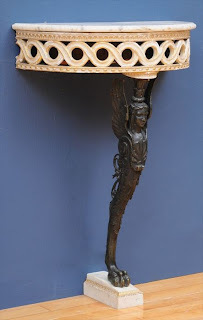 The bronze caryatid and the carved circle decoration make this very chic. This is included in the Stair Galleries auction Sept. 25th and 26th in Hudson, NY. It is 33.5" tall, and 23.5" wide. It has an estimate of $800 - $1,200. For a more modern profile, this pair of wrought iron marble topped console tables have clean lines, and a smart look. They are 39" tall and 23.75" wide. You could use one or both in a small entry way. If you use both, have something decorative sit between them like a chair, or a tall vase. They are included in the Christie's Interiors sale at the end of the month in New York, and have an estimate of $1,500 - $2,000. You will need a nice mirror over the console table. People love to check how they look arriving and departing! I would probably pick something with clean lines for a small space. This Queen Anne style walnut pier mirror would go with anything. It's offered in the Stair Gallery auction later in the month in Hudson, NY. It's 37.5" x 17", and has an estimate of $400 - $800. It's elegant and simple. Find other ways to define the space such as painting the wall behind the console table a slightly darker or complementary color to the rest of the room. Add a small rug and a ceiling light fixture. And if you have the room, add a 'hall' chair (see Chairs as decorative objects for more). If you have more space, then a full size console table will look terrific. Check my Decorating with console tables for more. Whatever you do, find a way to create an entry that expresses who you are to anyone coming to visit your home! If you have any photos of how you tackled this challenge, send them in.